They tore down my gas station last February and are replacing it with a Walgreens. I am decidedly not happy about this development. The corner of Lawndale Avenue and Pisgah Church Road used to house a great little gas station. They even had a small garage with a mechanic. It's where I used to get my oil changes and state inspections taken care of. It was great, because it was within walking distance from my office. Even after I changed jobs, I still frequented the station because it was close to my house. It was also on the main road I took whenever I was leaving town, so it was always a great place to top off the gas tank before going on a trip. Then, the garage shut down. So I got my oil changes and inspections done somewhere else, but I still used that station as my primary fueling location. Then, last February, they tore the station down. I was hoping it was going to be replaced with a different gas station, because that corner is a great place to have a gas station. After a while, they started construction of something new. It was obvious that it wasn't going to be a gas station. A few weeks after construction started, I noticed a stack of lumber with "Walgreens" spray painted on it. 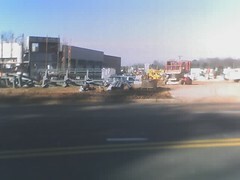 A few weeks after that, they put up a "Coming Soon -- Walgreens" sign by the construction. I'm not happy about this at all. Within a mile of this spot, there is at least a CVS, an Eckerd's, and probably more pharmacies that I'm forgetting. This corner does not need another pharmacy! A gas station is much more useful. It's true that there are several other gas stations near the corner, but I always thought that corner was a great spot for a gas station. On my way back from lunch today, I snapped the attached picture while stopped at the stoplight. I was on Pisgah Church Road heading away from Battleground Avenue (east, I think). So that's what the corner gas station near my office looks like now. In addition to losing a gas station, I'm losing a bit of a view. The triangle patch of land that was bordered by Pisgah Church Road, Lawndale Avenue, and Martinsville Road used to have a decent view while driving on any of the sides of the triangle. Now, there's going to be a huge, hulking, sterile building to mar the landscape. We have the same problem where I live. Within about one mile of each other there are an Eckerds & Walgreen's (across the street from each other!) and a CVS (down the road a bit). The mass of chain stores and strip malls marches on. There's another Walgreen's going up at the corner of Pisgah Church and Elm. Right across the street from Eckerds. Just as big. Just as ugly. The drug companies may be making billions, but the drugstore companies seem to be where the real money is.